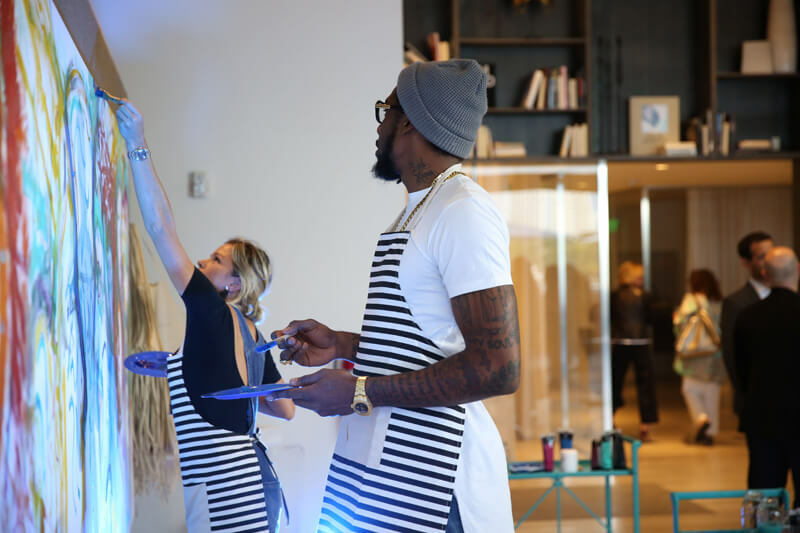 Last night, Wednesday, April 6th, Miami Heat Star and art enthusiast Amar’e Stoudemire and artist Daniel Arsham hosted a Miami “In The Paint Series” event in collaboration with Whitewall Magazine. 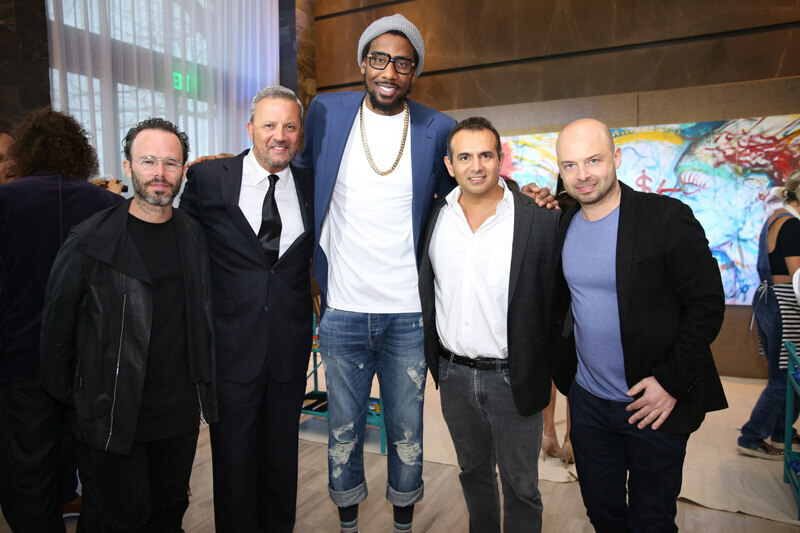 The fête, held at the Ritz Carlton Residences Miami Beach, was to benefit The Amar’e Stoudemire Foundation. Guests participated in a live interactive art installation by artist Tatiana Blanco and enjoyed special hors d’oeuvres and Perrier-Jouët champagne. 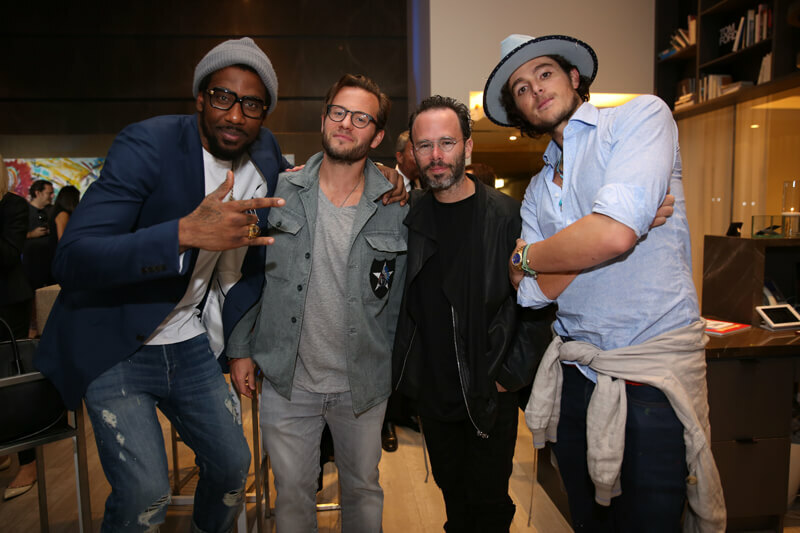 At the close of the evening, Stoudemire and Arsham announced their plans for future collaborations. 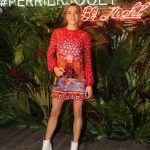 Among attendees were Matthew Chevallard of Del Toro, George Bramford of Bramford Watch Dept., Whitewall Magazine’s Michael Klug, and Ritz Carlton Residences Miami Beach developer Ophir Sternberg. At the age of 14, Amar’e began to play organized basketball, which changed his life forever. Despite playing only two years of high school basketball, Stoudemire earned many awards, including the USA Today All-USA Basketball First Team, Florida’s Mr. Basketball, Orlando Sentinel Florida High School Player of the Year and was invited to play in the McDonald’s All-America Game. His phenomenal skills earned him interest from colleges around the country, but with his star on the rise, Stoudemire entered his name in the 2002 NBA draft. He didn’t take long to become one of the NBA’s top players. Stoudemire is now part owner of Hapoel Jerusalem Basketball Club. His TV & film credits include Entourage, Law & Order: SVU, and The Exes, and summer 2015 hit film Trainwreck. 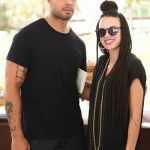 He is also an author and producer of films and can be regularly seen attending fashion weeks around the globe as a fixture in the fashion world. 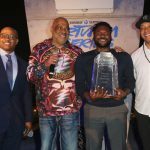 Is an experiential art series targeting underprivileged youth in communities across the country to expose them to the arts and basketball. It’s a play-off of “In the paint”- a term used in basketball and in art, a celebration of Stoudemire’s love for both. 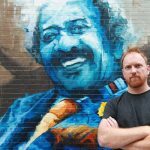 Through his own Melech Collection, his artistic platform, he will connect with local emerging contemporary artists to create “In The Paint” experiential events which will include live art installations, where he and the artists will paint together with youth in the community. 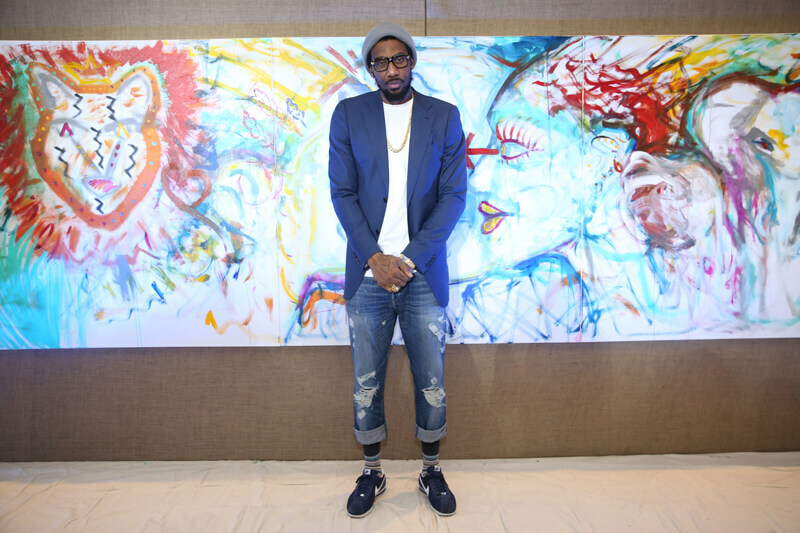 Stoudemire’s goal, with the help of leading artists in regions throughout the country, is to start this nation wide movement, that will launch in various cities, to engage youth and aspiring art enthusiasts and expose them to the arts and basketball. New York based artist Daniel Arsham’s multidisciplinary practice challenges the line between art, architecture and performance. Raised in Miami, Arsham attended the Cooper Union in New York City where he received the Gelman Trust Fellowship Award in 2003. Soon thereafter he was invited to create stage design and tour with legendary choreographer Merce Cunningham’s Dance Company leading to ongoing stage design practice and a sustained collaboration with choreographer and former Cunningham dancer, Jonah Boaker. Arsham founded Snarkitecture with partner Alex Mustonen in 2007. This architecture collaboration has included work with fashion brands, interior and architectural design, and a complete line of functional design objects.In 2014 Arsham’s, Films of the Future was born. This production company synthesizes all of Arsham’s creative output over the last decade and creates a visual setting in which his otherworldly and futuristic artwork might exist. Arsham’s work has been shown at PS1 in New York, The Museum of Contemporary Art in Miami, The Athens Bienniale in Athens, Greece, The New Museum In New York, Mills College Art Museum in Oakland, California and Carré d’Art de Nîmes, France among others. Whitewall is a premium contemporary art and luxury lifestyle media platform dedicated to revealing the world of art, fashion, and design through exclusive interviews and editorials focusing on leading artists, designers, and visionary minds of today’s world. 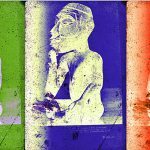 For the past 10 years, Whitewall aimed to go beyond the stark white walls of the art gallery to deliver an unprecedented intimate experience and unique educational platform for aspiring collectors and most discerning art aficionados and luxury savants alike. Whitewall reaches out to its cultured target audience through smart tailored content, luxe aesthetic, and full-service print and digital marketing partner opportunities. Visit Whitewall at whitewallmag.com or download the free Whitewaller app from the App Store. Tatiana Blanco is a multi-media artist and sculptor. She was born in San Jose, Costa Rica in 1984. As an international artist she divides her time between Miami, Puerto Rico, and Switzerland. Currently Tatiana resides in Miami while developing “Return to One”, a new series of sculptures. She describes her sculptures as a fusion of classical training and modern awareness, handling an array of materials with a contemporary hand. As an artist and mother, Tatiana is intrinsically a creator. The goal of her current work is to demonstrate the universal interconnectedness between living beings. Her works are in corporate and private collections across the U.S. and abroad, and have been included in numerous publications. The principals of Lionheart Capital combined bring more than 50 years of experience to the acquisition, development, repositioning and marketing of real estate assets totaling over $4 billion in the United States, Brazil, China and the Caribbean. Recent ultra-luxury developments include The Ritz-Carlton Residences, Singer Island, Palm Beach and Le Sereno hotel in St. Barths.